"redBlog ASP personal blog suite" is not affiliated with RedBLoG php. to get started with redBlog, determine the results of the following test. 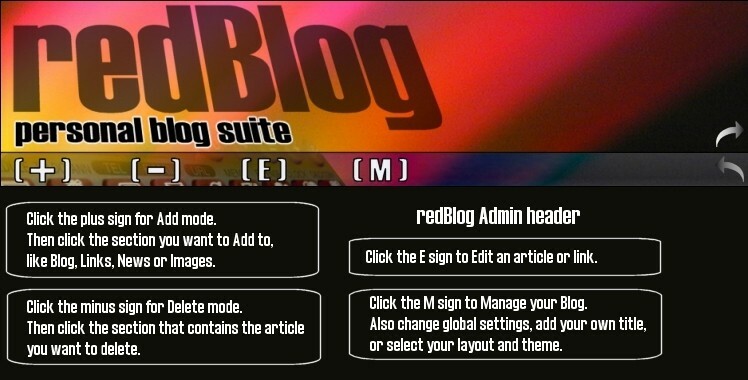 after the test is completed successfully you are ready to install redBlog! 1.) Type http://localhost into your browser and see what comes up. 2.) Depending on the results of your test, you should see a Welcome screen. Preview your new redBlog: The header below replaces your normal blog header when you need to make changes. Each symbol on the menu changes the URLs of your blog content, allowing you full control from one page. 1.) Don't pay for extra services like blog-hosting at blogspot.com; host from your broadband connected PC and get more value from your broadband connection. 2.) According to the Terms of Service at blogster.com, your blogs can be deleted at anytime and they are not liable (of course). You can have peace of mind backing up your blog when you need to. 3.) Customize the client-side and server-side code of your pages with free templates. Access your Windows XP User Authentication from anywhere. using easy to change templates. Point-And-Edit makes it easy for you edit pages online. New/Custom Windows XP GUI controls for a User-Friendly environment. Multiple User, Organizer, Custom Browsing and Content. PDA, RSS, Flash compatible, Google Searchbot Compliant. Websites that look great for your intended audience. Self-Edit gives you control over your data. your eBay stuff? Edit your own catalog online with Self-Edit technology from Blue Puff. a Custom Blog Solution for your PC. Get Started with your own blog today!